Earlier this month, Jamal Khashoggi walked into the Saudi consulate in Istanbul. No one has heard from him since. Here was a legal resident of the United States (he also lived in London and Istanbul), whose main English outlet was the Washington Post, vanishing suddenly after rebuking the domestic and foreign policies of Saudi crown prince Mohammed bin Salman. What happened? Turkish authorities say he was murdered. And they are pointing fingers at a team of Saudis who entered the country a few hours before Khashoggi disappeared—and departed shortly thereafter. The Saudis deny everything. As for President Trump, he, like the rest of us, is looking for answers. This is more than an episode from a Robert Ludlum thriller. 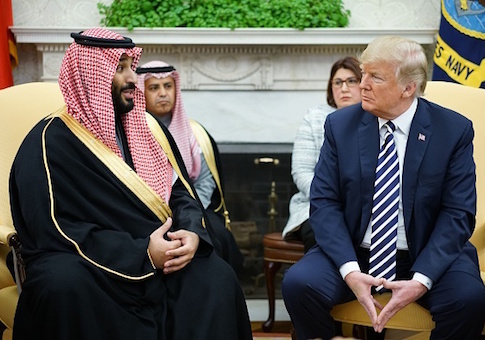 One missing man has the potential to affect the U.S.-Saudi alliance and Turkish-Saudi alliance, as well as the overall configuration of power in the Middle East, global energy prices, and Israeli security. For if the Turks are right, the Saudis would have committed a brazen, reckless, terrible act. They ought to pay a price. How high? A bipartisan group of senators wants the president to sanction Saudis complicit in the disappearance and possible murder of Khashoggi. Rand Paul would go further: He wants to force a vote on ending arms sales and military assistance to Saudi Arabia. "The Royal Saudi Air Force (RSAF) is entirely dependent on American and British support for its air fleet of F-15 fighter jets, Apache helicopters, and Tornado aircraft," writes Bruce Reidel of the Brookings Institution. "If either Washington or London halts the flow of logistics, the RSAF would be grounded." That is the sort of outcome Rand Paul and Bernie Sanders would like. They too are critics of the regime, especially its intervention in Yemen against the Houthi rebels backed by Iran. Typically an outlier, Paul is for once at the center of an emerging coalition that encompasses liberal internationalists, progressives, paleoconservatives, and neoconservatives. "If the crown prince's government does not immediately explain what happened to Mr. Khashoggi, and punish those responsible, it must be punished with sanctions—by Congress, if Mr. Trump cannot bring himself to act," says an editorial in the Post, not normally inclined to Paulist views. The passions inflamed by the potential state-sanctioned murder of a famous journalist who was a friend to many in the worlds of diplomacy and media do not subside easily. Before taking action, congressmen and administration officials ought to think seriously and dispassionately about the potential fallout of the course advocated by Senator Paul. It would not benefit anyone, least of all the United States, if Iran ends up gaining most from the Khashoggi affair. Because Iran, while not mentioned in relation to Khashoggi, is nonetheless a factor in this story. It is pressing against the Saudis on multiple fronts. It has fostered Shia rebellion within the kingdom itself and in Bahrain. It has armed and abetted the Houthis. Its proxies are on the cusp of victory in Syria, effectively control Lebanon, and have sown chaos in Iraq. Iran's European allies are attempting to create a financial lifeline that would provide relief from U.S. sanctions. Saudi Arabia has been the linchpin of America's Middle East strategy for close to a century. That relationship has not been without costs. What would the cost be if the alliance fractured? The Saudis would be imperiled in Yemen, potentially endangering the free flow of traffic in the Gulf of Aden. Iranian victory there would extend a Shia crescent in the south to accompany the one running through Iraq, Syria, and Lebanon. Governments without democratic legitimacy are brittle and unpredictable—a fact highlighted not only by Khashoggi but also by recent Saudi actions against Canada and the crown prince's delayed IPO of oil giant Aramco. America has sustained and protected the Saudis for decades. Withdrawing such protection would open the regime to both domestic and international challenges. As President Trump put it recently, Saudi Arabia wouldn't last two weeks without American support. The Middle East and Levant already are filled with examples of state failure. Is America prepared to risk another? Punish the Saudis if it turns out they acted no better than Russia, China, North Korea, Syria, and Iran. And as you weigh the evidence and consider the form of reprimand, keep in mind the following: the penalty must fit the crime; neither democracy nor peace is likely to follow the end of the House of Saud; and the morality of cable news and the op-ed page counts for little in the ruthless, brutal, conspiratorial, and bloody Middle East. This entry was posted in Columns and tagged Iran, Saudi Arabia. Bookmark the permalink.